Mainstream bike headlights haven't changed much since last year. This year's offerings are a bit brighter, have some minor changes in features and appearance, and have practically unchanged battery life. Fortunately, some new lights are starting to challenge the conventional headlight design, and several of these make it onto the 2016 recommendations list. If you're looking for a quick recommendation, scroll down to the specific lights we've chosen. If you want to know more about how we chose them and what to look for in a light, keep reading right here. The first thing many people ask is how many lumens their headlight should put out. While lumen rating certainly tells you something about a light's output, it's not the whole story. Lumens tells you the total output of the light in all directions, but doesn't tell you where that light is going. Optics design changes where those lumens get pointed, and makes a big difference in how effective the light is. Two lights can have the same lumen output, but one can have a narrow, intense beam while the other isn't as bright in any one place but shines over a much larger area. The beamshot comparison tool helps illustrate this point, and is useful for deciding whether you like a light's beam pattern. I've rarely felt the need for more than about 500 lumens in an urban setting. Road riding can require more light or a more focused beam if you're getting up to high speeds. Mountain biking is a whole different story, and as someone who rarely mountain bikes I typically don't make recommendations in that area. Optical design is often overlooked in reviews, but is a very important feature of the light. Until recently, most bike headlights were built like flashlights, casting a circular and symmetrical beam with a bright spot in the center. This isn't actually a very good design for bike lights though! For most applications you want most of your light shined on the ground ahead of you, and some (but not too much) shined towards oncoming drivers. Some lights are starting to include horizontal diffusing lenses, which spread light out horizontally so more shines on the road and less shines above you into the sky or oncoming eyes. A few lights have special indirect reflectors, similar to a car's headlights, to reduce glare and shine light directly onto the roadway. One of these lights is recommended below. Nobody wants their light to die mid-ride. The advent of USB-rechargeable light has made it easier to keep lights fully charged and operating at their maximum output, but the demise of user-replaceable batteries means you can get stuck without light if your batteries do run out. I run my lights any time I'm riding, and I've never had a problem with lights dying during a commute, even when I was biking 45+ minutes each way to work. As long as you remember to recharge every few days, a USB-rechargeable light with a sealed battery isn't a problem for most commuters. If you're concerned about battery life but have your eyes on a light without a replaceable battery, you can also get a light which is brighter than you "need", run it at low or medium, and get much better runtime than a lower-powered light running at 100% all the time. When you start looking at longer rides, it gets more tricky. Most single-piece lights last at best 2 hours on their highest output, with few running longer than 8 hours on lower settings. 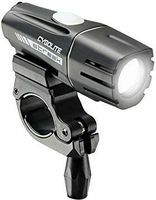 Several companies, including Serfas, Cygolite, and Cateye, have been selling single-piece lights with removable lithium battery packs for years. However, these lights – while good quality otherwise – package the battery cells in a proprietary casing that only fits into their lights, and sells additional batteries for $50+, when the underlying cells cost less than $10. Fortunately, 18650 batteries are gaining traction in bike lights. These standard battery cells are in most rechargeable bike lights, many flashlights, and even in electric vehicles. What a few manufacturers are now doing is making the bare 18650 cell directly accessible to the user, so they can buy their preferred cells at a fair price, and swap batteries any time – even mid-ride. If you need the ultimate flexibility or runtimes, look for a light that uses 18650 batteries that you can directly access. A few are highlighted in the recommendations below, and you can read our FAQ on batteries to learn more. Studies have shown that flashing headlights during daylight reduce collisions. Plenty of anecdotal evidence from cyclists supports this conclusion. Some lights now come with a specific "daylight flash" mode which is designed to be bright enough to see even in direct sunlight. If you ever ride around cars, I strongly recommend a light with this feature. High-intensity rapid flashing modes should be avoided at night. Some lights come with various nighttime modes. This can come in the form of a subtler "pulsing" mode which modulates between high and low output to grab attention without blinding. Others have a steady light, with the occasional quick brighter flash. I don't use flashing headlights of any sort at night, so I don't have a strong preference, but I do find the slow pulsing modes easier to see by. Mounts depend heavily on personal preference. I like quick-release mounts which come off with the light, so that you can take the whole package and move it to another bike without having to mess with screws. Quick-release rubber strap mounts tend to be less stable on the handlebars though, so some people prefer the more stable clamp design. Fortunately, there are lights with mounts of both types in the recommendations below. Each light review discusses the mount's convenience and stability in detail. A lot of other factors go into making a good light. Things like fast charging and battery level indicators, colors and design, weight, where the light was made, how easy the buttons are to use, waterproofness, and more can all affect your choices. Objective factors are typically covered in each review, but if a subjective factor is important to you, feel free to ask in the comments below for a recommendation based on your preferences. All Metro series lights now have "Enhanced Cycling Optics", Cygolite's marketing term for the horizontally diffusing lens that debuted on the Metro 750 last year. This spreads the beam more evenly across the road, and wastes less shining into the trees than the circular beams found on many other lights. Both the Metro and the Streak have a daylight flash mode that pumps out 500+ lumen flashes to ensure visibility even in bright sunlight, and also have a nighttime "steady pulse" mode which keeps the light on steady and flickers the beam occasionally to grab attention. More lights are starting to include daytime flash modes, but Cygolite's is particularly effective (not to mention they were first to offer this feature). The mount has been redesigned! I've been unhappy with Cygolite's headlight mounts since I first tried the Metro in 2011, and they've finally fixed these issues. The mounting clamp now has rubber pads built in to increase grip with the handlebar, meaning no more lights sliding around. The tool-free mount is easy to tighten and is far more stable than the old Cygolite mount. Check out the Metro 750 for our most recent in-depth review of a Metro series light. The others in the series share the same features, just different outputs and runtimes. The Cygolite Hotshot taillight series is also highly recommended in our taillight reviews. Various combo packs are available which can save you money if you're buying both. The Streak/Hotshot pack is often the best deal for people looking for the cheapest set of reliable rechargeable lights. It's typically available for under $60 on Amazon. Limitations in battery capacity and LED efficiency mean most bike lights won't last more than a couple hours on their highest settings. Most rides of course don't require nearly 1000 lumens, but few lights will last even 12 hours on their lowest settings. 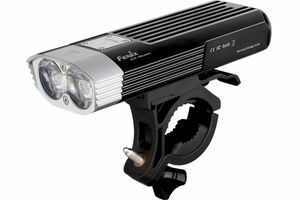 Both of the Fenix lights I reviewed this year offer an obvious solution that's been sorely lacking in the bike light market: high-capacity, cheap, user-replaceable rechargeable batteries. Both lights take 18650 batteries, the same type found in electric cars, laptops, and in fact many rechargeable bike lights. The difference is you can directly access the batteries in these Fenix lights, and replace them yourself on the road. Various bike lights are available with user-replaceable batteries, but they're always encased in a proprietary wrappers. With these Fenix lights, you can buy any standard 18650 battery – which are available for less than $10 each, compared to $50+ for proprietary battery packs that contain the same exact cells. The BC-21R is the most consumer-friendly of the two, and is better suited for commuting. It has onboard USB charging, comes with an 18650 battery included, and has side visibility lights. Its rubber strap quick-release mount makes it easy to take the light off when locking up in public, but isn't sturdy enough for serious trail riding. The BC-30 is a beast, packing 2x 18650 batteries. Two batteries gives the BC-30 excellent runtime and a higher max output, with up to 1:50 hours at 1200 lm and an impressive 20 hours at 100 lumens. 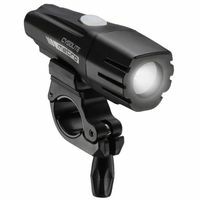 This light also has a much sturdier mount than the BC-30, and is perfectly suited for any kind of mountain biking. The batteries aren't included though, and require a separate charger. Our BC-30 review talks in detail about your options though, and the pros and cons of this light. Both Fenix lights also have great optics that help spread the light evenly across the road without casting too much into the sky or oncoming eyes. They also have nice neutral tinted LEDs, unlike many bike lights with cheaper blueish LEDs. This helps to make things look more natural and thus easier to see when riding at night. Both of these lights are available from BestLight.io, who provided the review samples I tested, for 10% off with coupon code "BLDBFAN". Serfas just released their new E-LUME headlight series, available from 200 up to 1500 lumens. All of them are very competitive on a dollars-per-lumen basis, and are great lights overall. The 850 lumen and below models have a single battery cell built in and weigh about 160 g, while the 1100 and 1500 have two battery cells and weigh about 240 g. For those looking for a super bright light at a low cost, the E-LUME 1500 and 1100 are hard to beat at $140 and $110 respectively, and for those on a budget, the E-LUME 450 is only $45, beating out the Cygolite Streak 450. The entire series employs well-made optics with a diffusing lens, spreading light evenly across the road. I've also always loved the Serfas headlight mount. The lights can be removed by sliding in/out of the mounting plate, or by removing the entire mount with its quick-release lever. The rubber strap can be adjusted to various handlebar diameters and is grippy enough to keep even heavy lights stable. The E-LUME lights also all have side visibility lights to improve safety in urban settings, and have both daytime and nighttime flash modes. I haven't yet published a full review of the E-LUME lights as I just recently received them, but based on my initial test rides and experience with previous Serfas products, I'm confident in recommending them. Obnoxiously bright LEDs blinding cyclists/pedestrians/joggers/alien spaceships is a common topic in pointless internet arguments. Simply pointing your headlight lower down doesn't always do the trick, as you need to see far ahead when riding at high speeds. The Ixon Core Flash by German light manufacturer Busch & Muller is the answer to this problem. This light shines its LED on a reflector rather than directly onto the road, giving it a unique beam pattern. The output is cut off sharply at the top, and casts a very consistent beam ahead of the bike. The total output of this light is far lower than the lumen-obsessed American lights, but by putting the light right where you need it and not throwing any where you don't, it manages to feel brighter than many mid-level lights with lesser optics. 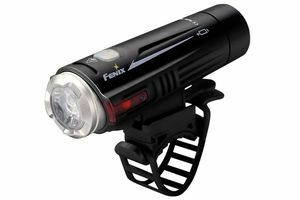 Unlike other European lights with similar optics, the Ixon Core Flash has an additional small LED above the main headlight which can be set to flash while the light is on. This visibility LED isn't too bright, but set to flashing mode helps draw attention without being distracting. The entire light can also be set to flashing mode if desired, particularly for daytime visibility. 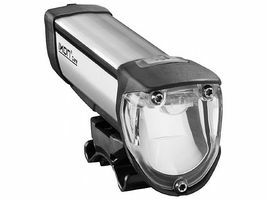 If you frequently ride in areas with lots of oncoming eyes that might not appreciate having a portable sun shined into them, consider this light. The full review goes into all the details like battery performance, mounting, and other functionality. Light & Motion's Vis 360 system is unique among bike lights. The Vis 360 has a 120 lumen headlight, and the Vis 360+ has a 250 lumen headlight. Both have an integrated taillight as well. 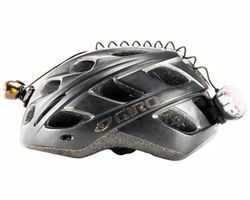 The system is designed specifically (and exclusively) for helmet use. While many headlights offer a helmet mount, they tend to be awkward to use, with the light sticking up and catching on low-hanging branches, and a big concentrated mass causing a high center of gravity on your head. Few taillights are designed for helmet use at all, and while it's possible to hack something together with zip ties or velcro, it's often dubiously effective and rarely attractive. The rechargeable lithium battery is built in to the taillight component, and a stretchy cord connects the small headlight component. 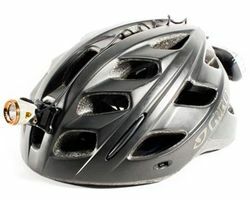 By keeping the battery separate, the headlight is small and therefore does not stick up high above the helmet. Both the headlight and taillight have integrated amber side lights, which results in a true 360° of visibility. A helmet light significantly increases visibility, as it's higher from the ground and can therefore be seen better than a bike-mounted light in busy urban environments with many vehicles and obstructions. I wouldn't use this as my only light – while the Vis 360+ puts out enough light to fully illuminate the road in most situations, helmet lights can be obscured by the angle of the rider's head, backpacks, etc. Used in tandem with a fixed headlight and taillight though, it provides a huge increase in 360° visibility.